Apple on Tuesday will take the stage at the Brooklyn Academy of Music, where it is widely expected to unveil the next-generation iPad Pro with Face ID and updates to a wide range of Macs, including the MacBook, iMac, and Mac mini. 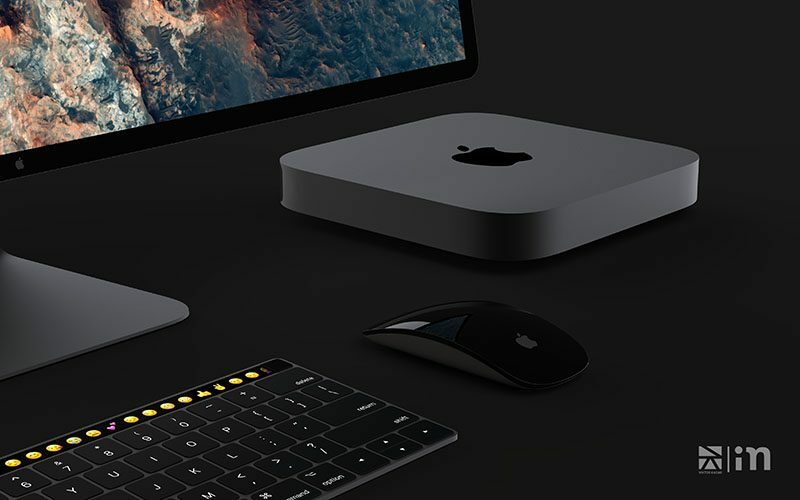 Ahead of the keynote, which starts at 10:00 a.m. Eastern Time, Hungarian industrial design student Viktor Kadar has created concepts that imagine a new Mac mini paired with a new Apple Display and a Magic Keyboard with a Touch Bar. Before anyone gets too excited: it's unclear what the new Mac mini will look like, a new Apple Display isn't coming until 2019, and there haven't been any recent rumors to suggest Apple plans to add a Touch Bar to the Magic Keyboard. But who doesn't love some sleek mockups to hype up tomorrow's Apple Event? 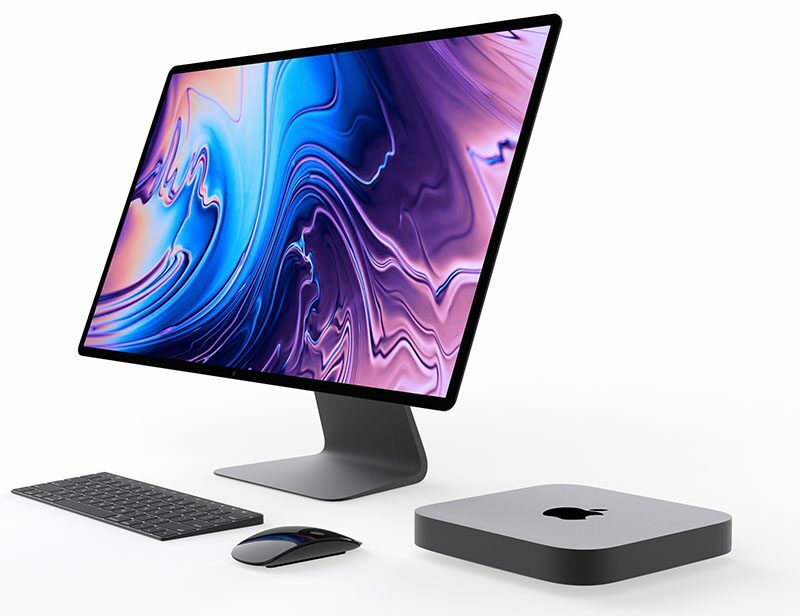 The new Mac mini as Kadar imagines it would feature a Space Gray finish with the addition of four Thunderbolt 3 ports, while the new Apple Display would be similar to Apple's discontinued Thunderbolt Display, but with slimmer bezels. Kadar shared the concepts with Hungarian blog iMagazin and later with MacRumors. Two reliable Apple scoopsters in Ming-Chi Kuo and Mark Gurman both expect the new Mac mini to feature upgraded processor options, while Gurman added that the portable desktop computer will gain new professional-focused features. Neither source has revealed details about its design or other tech specs. Way back in April 2017, the blog Pike's Universum said that a new high-end Mac mini would be released with a design that "won't be so mini anymore," suggesting the most expensive configuration might have a larger or taller design to accommodate for upgraded tech specs. The blog has a hit-and-miss track record. We do know Apple is working on a new professional display to complement a new Mac Pro. Apple made the rare move of confirming both products will be released in 2019, as part of its reassured commitment to professional users. Apple could surprise us with a sneak peek of those products tomorrow, but we haven't heard anything. In any case, we'll find out tomorrow. MacRumors will be live on location at Apple's event inside the Brooklyn Academy of Music, with coverage on MacRumors.com and through @MacRumorsLive on Twitter. Looks real nice. I’d take that. These are great if you want to maximise your disappointment for tomorrow's event! Here is what I would like to see announced. Concepts are a bit pointless when there’s no actual leak of anything tangible on which to base them on. At least concept iPhones have loads of case schematics to work with. Someone actually bothered to conceptualize an Apple display despite Apple making it explicitly clear they want to be out of that business. Apple in 2017 they said that are working on the next mac pro and apple display. One of the weakest Concepts I've seen for a while, literally changed the color of the mini and thrown loads of ports on the back, the Ethernet and HDMI don't look to the correct scale? I actually hope the new Mac Mini is a tiny Cube form-factor. As unlikely as it is, I'd prefer a keyboard with the same travel as Apple's current offering. I wonder if the butterfly mechanism was developed—not only for thinness but also—to make the transition from physical keys to touchbar less jarring. Apple has said that they are going to be marketing new displays with the new modular Mac Pro. Schiller himself said that on stage, I do believe. They should change the name to Mac (more simple, like the MacBook) and make it beefier. I want a Mac Upgrade Program. I want it to have a mid-range discrete GPU, mid-range six core processor, a fast SSD, and upgradeable RAM. Somewhere around $2000 every four years, and after you've made 24 months of payments, you can trade in for the new model. Around $500/yr to always have a new Mac, or you can pay it off if you want to keep it. I do professional work, but it's mostly photography, graphic design, and web design/development. I sometimes edit video, but it's rare. I've come to the realization that the only reason I buy higher-end Mac hardware is because I want it to last a long time. But I would be perfectly fine with mid-level hardware if I had a bi-yearly upgrade path. And after two years, a new mid-level machine is likely to be similar to a two year old high-end machine. After four years, it will be even better. I'm currently on a 6 year cycle with my personal Macs (my work one is in my sig because I gave my personal one to my grandpa). This concept is idiotic. The touchbar + MBP style keyboard would be a horrible device considering how awful those feel on the laptop. Apple announced they were going to introduce a new Apple made display with the upcoming Mac Pro.